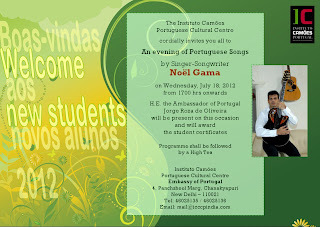 Happy to have been invited to perform a set of Portuguese songs at Instituto Camões, Embassy of Portugal, New Delhi on the 18th of July 2012. Couldn’t miss this great opportunity which, turned out to be an important milestone in my journey and more importantly, in my mission of popularizing Portuguese Pop/Folk music. I live in Daman (Damão – a former Portuguese enclave on the western shores of India, which became part of India as recently as 1961) where there’s a strong Portuguese influence in the culture, music in particular. While Daman Day (2nd February), Daman’s biggest folk festival, celebrates and showcases its Indo-Portuguese culture, my blogs and websites help in recording, preserving and even propagating it to a certain extent. As an award-winning writer of the Writers Bureau (UK) and author of Culture Wise India (Survival Books Ltd, UK), I’m now putting this experience into writing a series of books on the Indo Portuguese culture of Daman and in writing/recording new folk songs to complement the books. It was a solo performance at Instituto Camões in my ‘Unplugged’ avatar – just me and my Ovation guitar and a digital vocal harmonizer – the others being, ‘Concert’ (Midi guitar OMB) and ‘Grand Concert’ (Arranger keyboard OMB). The songs were covers of contemporary Portuguese songs in the Pop & Romantic genres with a couple of traditional folk songs thrown into the mix as well. That’s about all you’d expect from someone who’s an HR Pro by day, author by night and singer/songwriter on very special evenings, like this one. Must get the G-string right! More treble on the vocals, please! The audience couldn’t really know what to expect from a nonfiction author! A few seconds in the dark before the ‘curtain’ went up! Threw two trads into the mix – Encosta a tua Cabecinha – arguably, the most popular Portuguese trad in India. One of the first songs my mother taught me as a little boy. Followed by A historia que eu vou contar – I’d need to write a voluminous book to tell the story of a complicated woman. Not that I would succeed though. The songwriter tried to tell it all in just one verse! 11th reason to learn the Portuguese language: You will better appreciate the songs when you understand what’s really being said between the lines of the underlying lyrics and like me, you may discover that “Saudades” is the God particle of the Lusophone world! The ambassador said he’d be visiting Daman very soon! The post Musicking Destination: Instituto Camões, New Delhi! appeared first on Noel Gama. 2019 © Noel Gama. All rights reserved.